Decorative Life: 4-8 days, up to 14 days. Harvest when flowers are about 70% open. Member of the Plumbaginaceae (Plumbago or leadwort family). Native to the Mediterranean region and the Caucasus Mountains. Related species include Armeria, Ceratostigma. Tiny flowers with colored papery bracts occur in one-sided ranked clusters at stem ends. Store at 36-38F (3 days or less), 32-34F (more than 3 days). 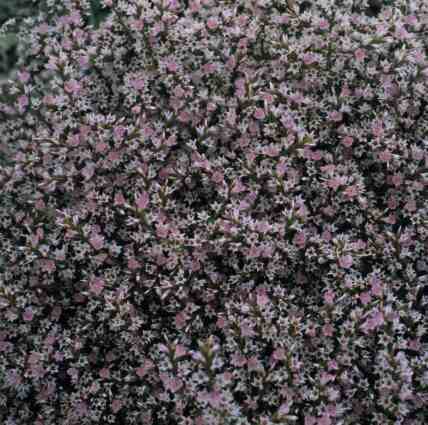 From the Greek “gonio” (angled) and “limonium” (a related genus). Also known as Limmonium tartaricum. Statice is an ideal addition to fresh and dried arrangements. Native of the coastal and desert environments of the Mediterranean, central Asia and the Canary Islands, the durable Statice flower “clusters” can be dried by cutting the stems and hanging them upside down in a cool, airy place.